Of all the world's costume-heavy seasonal holidays, Día de los Muertos is perhaps the least understood. Yet in Los Angeles, where makeshift memorials to the dead often appear overnight, Día de los Muertos is part of our cultural heritage. It's also an opportunity to witness a historic custom in practice, especially since food plays a big part in honoring the departed. Also known as the Day of the Dead, the Latin American holiday officially takes place on November 2nd, and can be traced back to pre-Colonial Aztec culture. While there is some crossover, Día de los Muertos is not to be confused with All Saints' Day or All Souls' Day (November 1 - 2), and especially not Halloween. Instead, it's meant to honor the spirits of loved ones who have died with a multi-sensory celebration, courtesy of their earth-bound hosts. Gravesites are cleaned and decorated with ofrendas ("offerings"), including flowers, incense, and especially, food and drink. But because the dead are not physical beings, they're supposed to be extracting only the essence of the offerings -- in fact, some believe it's how the term "spirits" became associated with distilled beverages. The kind of food and drink served on Día de los Muertos often depends on the taste of the honoree, but it's customary to make their favorite dishes, which are usually also the most labor-intensive -- like moles and tamales. Pan de muerto, or "bread of the dead," is a sweet dish exclusive to the holiday -- made with plenty of egg and sugar -- as are calaveras de azúcar, or tiny sugar skulls. The skull is meant to represent the head of the departed, while the altar signifies the body. 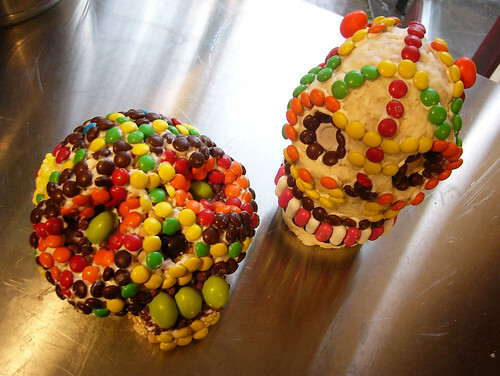 Some calaveras are made with amaranth, with walnuts for eyes and peanuts for teeth. Other Día de los Muertos ingredients include chile, chocolate, and candy made from pumpkins harvested specifically for the holiday. And who could forget libations? Popular pre-European drinks include pulque, atole, and of course, mescal. There should also be plenty of water on hand for thirsty ghosts, since they've traveled all the way from the beyond to take in their memorials. In L.A., the centerpiece holiday event is Día de los Muertos at Hollywood Forever Cemetery, the country's largest Day of the Dead celebration. The party usually opens with an Aztec ceremony, then kicks into an all-day festival party with music, dance, arts, crafts, and culinary delights. But the altars themselves are the real draw, actively telling stories about the departed with colorful clues into the person's life on earth. For instance, Johnny Ramone's grave is decorated with boxes of Yoo-Hoo, while tributes to late movie icons like Marlon Brando feature empty bottles of red wine and occasionally, cigarettes. Not to be outdone by the cemetery, several bars across the city are bringing Day of the Dead cocktails to life, too, many using harvest-themed ingredients. Dominick's in West Hollywood serves up The Corpse Reviver #2 using Hendricks, cointreau, and absinthe. Meanwhile, Christopher Bostick's Marigold Ofrenda at the Varnish features Espolón Tequila, chile powder, and an edible marigold garnish. Downtown, Drago Centro's Rimedio del pazzo ("remedy for the crazy") contains rum, fresh sage, and white peppercorns, as Malo's Isla de los Muertos ("island of the dead) is comprised of organic tequila, fresh lemon juice, ginger agave, and Tapatío hot sauce. Finally, Mäni's on Maple in Beverly Hills busts out the Pisco Maleado ("Spanish badass"), featuring BarSol Pisco, lemon, lime, agave nectar, egg whites, cucumber and mint. Now, these are the kinds of spirits we can live with.